The 2013-2014 Subaru Legacy sedan and 2013-2014 Outback crossover scored the highest in a new IIHS safety rating and they use a safety system called EyeSight that is better than all the competition. How can a small automaker like Subaru develop the best crash avoidance technology of any automaker when they are competing against the largest automakers in the world? They have just blown away the top automakers known for safety and have developed the best front crash avoidance system in the world. It’s called EyeSight and it’s better than anything else out there. Subaru has been recognized for the fourth consecutive year (2010-2013), by the Insurance Institute for Highway Safety (IIHS) as the only manufacturer with a TOP SAFETY PICK winner for all of its models. And now the 2013-2014 Subaru Legacy sedan and Outback crossover are the only cars out of 74 tested, to entirely avoid a collision at 25 mph. Who has the worst crash avoidance systems? The Infiniti QX50 completely failed the test and earned the lowest rating of all the vehicles. The IIHS had “harsh words” for the BMW 3 Series and the Toyota Prius V failed to provide sufficient protection. Those are three very prominent automakers and they can’t produce a front crash avoidance system that works. How does the small Japanese automaker consistently do it year after year? Subaru is owned by Fuji Heavy Industries Ltd (FHI) who also has an aerospace division and makes parts for Boeing, helicopters, aviation business jets and industrial power products. They also have an Eco Technology Division that manufactures garbage trucks, robot sweepers and wind turbines. What makes Subaru so successful, is the fact that they get the latest technological advancements from FHI, which ends up in Subaru cars that includes a great deal of this aircraft technology. The EyeSight safety system is one of those technologies they benefit from by being owned by a great company like FHI. How does the system work? EyeSight uses two charge-coupled device (CCD) cameras mounted inside the car on the upper edge of the windshield. The EyeSight system processes stereo images to identify the vehicles traveling in front, as well as obstacles, traffic lanes and other items. The video information is relayed to the EyeSight computer, which is also networked with the car's braking system and electronic throttle control. Below speeds of approximately 19 mph, EyeSight is capable of detecting pedestrians in the vehicle's path and can activate to mitigate or even avoid the collision. Under certain circumstances, EyeSight is able to bring the car to a complete stop, thus avoiding a collision. Subaru is the global leader in this technology and the proof is in the recent IIHS tests. "Our buyers trust us to provide safety in their vehicles" said Thomas J. Doll, president and COO, Subaru of America, Inc. "With all of our 2013 models listed as IIHS Top Safety Picks and now the 2014 Legacy and Outback models tested to 2013 TSP+ and FCP status, this is further proof that we deliver on that trust." 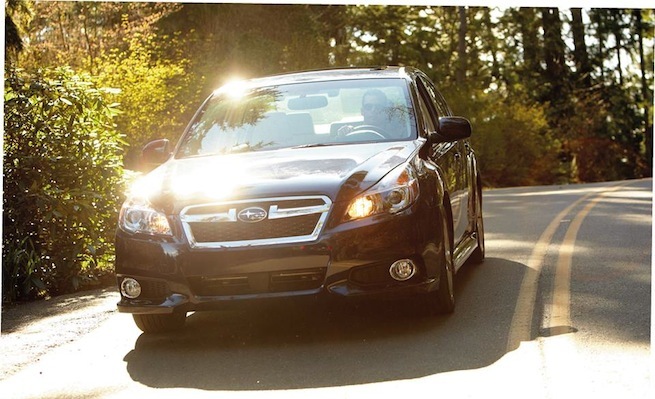 The 2014 Subaru Legacy and Outback with EyeSight scored better than any automaker. It’s the best front crash avoidance system and is also available on the new 2014 Subaru Forester. It’s also one of the most affordable of such technologies available. Watch the CNN report on the IIHS test and Subaru EyeSight video.